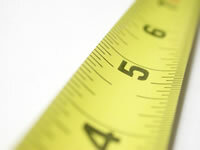 At Calico, we offer — and highly recommend — professional measuring and installation services. Think of these services as inexpensive insurance policies to ensure your window treatments will fit just right and look gorgeous! Read on to learn about the value of professional measuring and installation, followed by guidelines for taking your own rough measurements that you can take to your Calico store to get a quote. Why should I opt for professional measuring? They'll take exact measurements — and Calico will be fully responsible for the products made to these specifications. They'll check where valances or cornices will be positioned and make sure that any window treatments beneath will fit and function properly. Why should I choose professional installation? Our installers are specialists — this is all they do. They have all the tools and tricks to help window treatments hang beautifully. They have the skills necessary to ensure the weight of the treatment is properly supported, and that care is taken to protect woodwork. They'll steam and dress draperies and shades to hang beautifully and break properly when opening or closing. Use our worksheets to record your measurements, then take the completed worksheet to a Calico store where an associate will provide a custom quote. From there, the associate will help you choose fabric and window treatments, and schedule the in-home measuring and/or installation services. Of course, these services are optional — you can instead use your own measurements to order your window treatments, and/or perform your own installation. Use a metal measuring tape, not a ruler or cloth measuring tape. Write your measurements in the spaces provided and double-check them! 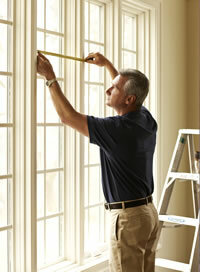 Measure all windows, even if they appear to be the same size. The differences may surprise you. Note the location of each window, using multiple forms as needed. For decorative traverse rods and café curtains hung by rings, start measuring from the bottom of the rings. Inside mounting allows the window treatment to hang inside the frame of your window. Check the depth so that we can be sure it will accommodate the mounting board. When taking measurements for inside-mounted window treatments, please do not deduct any allowances. Outside mounting allows the window shade to hang above the window casing or molding. It may also give the illusion of a taller window.